Michael is the driving force behind Bullets & Broadheads. Michael has numerous animals that have qualified for Boone & Crocket and Pope & Young, including a non-typical Texas state record whitetail buck. Michael’s passion and drive for the outdoors has pushed his outfitting business to be one of the finest hunting organizations in Texas. Sonia is the supportive wife and mother who takes care of the home front while the boys are out in the field. But don’t let that pretty lady fool you. She can hold her own in the field with a gun or bow. 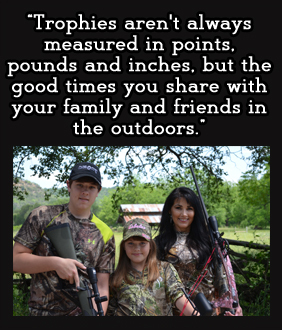 Sonia loves fishing, waterfowl and big game hunting, as well as wing shooting. Michael J is a very avid hunter, and very accomplished for his age. Michael J has animals that have qualified for Pope & Young, Boone & Crockett, and Trophy Game Records of the World. Michael is respected by his high school peers for his outdoor accomplishments. Michael’s passion is shared with his friends by organizing hunts for ducks, deer, goose, prairie dog, and dove. Michael’s drive and passion for waterfowl hunting is second to none. You will never see Michael without a smile on his face.